A UK nuclear power plant, Oldbury Unit 2, is getting a six month license extension (through June 2011) so that it can be shut down the same month as Oldbury Unit 1 is scheduled to shut down -- unless further license extensions are granted: They are also vying for a 2012 closure "in order to use up spare fuel at the site". What a LOUSY reason to keep a nuclear power plant operating! Unused nuclear fuel is mathematically about 10 million times safer than so-called "spent" fuel, which is just about the most dangerous and difficult stuff on earth to handle. "Fresh" fuel is not much more dangerous than so-called "depleted" uranium (DU) -- the stuff that soldiers handle "safely" all the time. The main danger from DU occurs when it's been exploded into tiny fragments and vaporized -- at which point it can be inhaled or ingested, and is horrifically poisonous, partially for its heavy metal toxicity characteristics (yecch! ), as well as for its radioactivity. A "critical mass" (or "criticality") is achieved in a nuclear power reactor (steadily and predictably, if it operates according to plan -- otherwise it's a "meltdown") or in a nuclear bomb (exponentially more frequently over microseconds of time, if it operates according to plan -- otherwise it's a "dud") by collecting together a large enough "pile" of nuclear fuel. Once the pile is big enough, or when control rods that prohibit the chain reaction are removed, collisions of decay products with the uranium atoms in the pile cause some of the atoms to "fission" (split or cleave) into (usually two) roughly even-sized chunks, releasing a few additional neutrons, as well as gamma rays and other types of energy in the process. The neutrons collide with other uranium atoms, keeping the reaction going. In a power reactor, a careful balance is maintained to sustain the "chain reaction." Various systems are available to the operators to slow the reaction down by small fractions of the total output if it starts to increase in power/thermal output above the desired level for any reason, or to stop the reaction entirely. It's always assumed (by the nuclear regulators and the nuclear industry) that one of the several backup systems will work properly, which is an iffy assumption at best. Many of the backup systems have never been tested at full size, let alone in the real world. In one case, shipping bolts were left on for thirty years, rendering the "Emergency Core Cooling System" inoperative that entire time. They checked when a different plant realized THEY had left similar bolts on! This would have caused an "out-of-design-basis" accident, had the cooling system not been available when called upon. The unthinkable -- and uninsurable -- would have happened. Even the most advanced reactor designs have thousands of potential accident and terrorist / war / natural disaster scenarios which could result in a core meltdown and massive release of radioactive fission products to the surrounding environment. 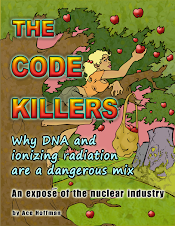 The government refuses to study the actual details -- it's just too horrific and would shut the door on nuclear power generation forever if they were to update the 1982 CRAC-2 report. That report was so devastating, it was suppressed, denounced, and ignored by the government regulators who had commissioned it, as well as by the entire nuclear industry. In truth, CRAC-2 didn't go nearly far enough in estimating how bad an accident could be, and also probably underestimated their rate of occurrence. There have been enough close calls (plus Chernobyl in 1986) to assume so. The average reactor is much older now than they were ever expected to become -- 2nd and 3rd 20-year license extensions are granted routinely to any and all types of nuclear power plants, regardless of efficiency. Yet they are ALL already cracking and leaking. They are highly irradiated and embrittled. Catastrophic failures increase in likelihood daily, and many parts can't even be inspected and are not on the blueprints. Our nuclear infrastructure is ripe for catastrophic failure. And the populations around the plants have grown tremendously. Normal radioactive decay of uranium (element 92) starts with a sudden, unpredictable release of an alpha particle, which is a very high speed helium atom with no electrons attached. This initial radioactive decay is followed by additional releases of alpha and beta particles, gamma rays, and other energy forms. Natural radioactive decay of uranium does not involve nuclear fission. The end-product of the various natural decay chains, typically 20 or more steps, is usually lead (element 82). Not, say, radioactive Strontium-90, which comes almost exclusively from atomic bombs and nuclear power plants, as does Cesium-137, Iodine-131, and many other radioactive isotopes which are produced from fissioning (splitting) larger elements in a nuclear chain reaction. These lighter elements -- "fission products" -- are themselves radioactive because they invariably have too many neutrons to be stable. (The "stability curve" of isotopes illustrates this). Fission products decay by releasing a beta particle (a high-speed electron), sometimes accompanied by, or followed by, a gamma ray or an x-ray energy burst. Beta particles are negatively charged and are able to damage things they merely pass close to, especially after they've slowed down from their original speed, which is nearly (>99.7%) the speed of light. At that speed, they pass so fast, they aren't around long enough to do much damage. It can take a dozen or more radioactive decay steps, and many thousands of years, with each step occurring at some random time (each isotope of every element has an average half-life) before fission products decay into stable elements. Some fission products are radioactive isotopes of elements that living organisms use as part of their structure. Living organisms cannot distinguish between stable and unstable atoms of the same element until the moment of decay, when there is an enormous (on an atomic scale) energy release inside the body. After a radioactive beta decay occurs, the new element, with one more proton, is no longer going to be useful in the molecule it was a part of inside the living system. For example, after a beta decay, Cesium-137 becomes Barium-137, Strontium-90 becomes Yttrium-90, etc..
As the beta particle is ejected, the rebound of the "new" atom may cause it to be knocked away from its position in a molecule. Not that it would matter: the atom's charge changes too, increasing by one proton's worth of positive charge, and it's now the wrong element anyway. If it was part of a DNA molecule, the DNA chain will be broken. Complex proteins, created with tens of thousands of atoms and hundreds of delicate folds and bends in the structure, are ruined when this happens. Cancers are sometimes begun. One beta particle can destroy tens of thousands of molecules as it passes them. The amount of fission products in so-called "spent" fuel depends on the amount of energy extracted from the fuel: The more energy released by the fission process, the more fission products there will be. As soon as the fuel is part of a "critical mass" it becomes very highly irradiated. The rest of the time spent in the reactor makes it all the more deadly, and all the more difficult to handle, and "hotter" both thermally and radioactively. Once the reactor fuel rods are removed from the reactor, the fissioning process stops, but the fission products remain. So using fresh fuel that's stored on-site is a VERY poor excuse to keep ANY reactor operating for even an extra minute, let alone six months! Besides, Oldbury Unit II is an inefficient old 217 megawatt reactor that should never have opened in the first place. It was commissioned in 1967. The operators of the reactor do admit to another reason they would like to keep the reactor operating: To help pay for "decommissioning." Another lousy reason to keep a nuclear power plant operating! "Decommissioning" funds don't cover final disposal costs of the spent fuel, which will be phenomenally expensive no matter how you slice it, dice it, encase it, decompose it, chemically treat it, glassify it, solidify it, liquify it, purify it, or dilute it -- unless, of course, you release the spent fuel into the oceans, the air, and the soil, which would be a crime against humanity (and which will probably be done, sooner or later). It will take hundreds of thousands of human generations before the radioactive isotopes will have all decayed to stable elements, but in just a few generations, or even a few decades, the fuel rods will have crumbled to dust from their own destructive forces, moisture, heat, vibration, and other forces. The dust will have flowed into the water table somewhere, and the water will have been diluted with cleaner water and delivered to millions of people. But nevertheless, they want to produce more nuclear waste at Oldbury. And the REAL reason they want to keep Oldbury running is to keep the site license operational. What they're really hoping for is a new, state-funded nuclear reactor or two, to be built at the site. It's the dream of every old nuclear reactor operator in the world. That, and to be loved. They might get the money. There never will be a safe way to store nuclear waste. I offer as "exhibit A" a pamphlet from more than ten years ago from the United States Department of Energy (DOE), misinforming us that Yucca Mountain, once built, would solve our waste problem after what was then twenty years of "scientific" investigation showing it to be suitable. A decade later, Yucca Mountain is still not suitable, and never will be. It leaks, it shakes, it caves in. It's just not right. I offer as "exhibit B" the simple logic that anything which produces ionizing radiation (alpha, beta, gamma, x-ray, etc. energy bursts) will, by definition, destroy any container you put that thing in! England has even fewer options than we in America do for their nuclear waste problem (if less than zero options is possible). No country has a solution, no country ever can -- except perhaps Japan, which seems to have contracted with other countries to take all their nuclear waste for "reprocessing," a procedure which requires transporting the highly carcinogenic waste thousands of miles over the open oceans, treating it physically and chemically, releasing vast quantities of radioactive and otherwise-deadly chemicals into the environment, reusing a small portion of the "quap", and storing the rest of the mess in flimsy containers too close to groundwater supplies SOMEWHERE. But despite all these problems, an extension for Oldbury was granted.